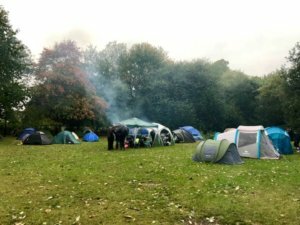 What an amazing effort by all those hardy girls and boys, and family members, who camped out in miserable weather conditions to raise money for SPEAR. You have so far raised in excess of £1,500 and still counting, which is such a fantastic effort. SPEAR is a charity the school is supporting for people experiencing homelessness in South West London, including Richmond. The aim is to move these people from homelessness to independence and those of you who sponsored our campers are helping to make this a reality for some people. Thank you sponsors and well done campers! Huge congratulations to our sporting teams in recent fixtures. On Monday, Our Year 5 and 6 girls won the Prospect House netball tournament, following on from the boys winning their football tournament at the Hall on the Friday before. This is a fantastic achievement; a huge well done to the players, supporters and teachers for this tremendous success so early on in the year. We have now set the standard for the year! I am sure those of you who attended the Anxiety talks this and/or last Thursday will agree what valuable evenings these were. Pupil welfare is at the forefront of our minds and these evenings follow on from a series of talks and workshops over the last few years that help parents and teachers to think about the complexities our young people may be faced with and some strategies for managing them within our own busy lives. Our school listener, class teachers, assemblies, PSHEE lessons and other areas of the curriculum all allow opportunities for children to learn and speak about any worries or concerns they may have. Last week I was at the IAPS Annual Conference for Head Teachers and the theme was – Tomorrow’s World; Global Citizens. There were some super speakers about various themes including School Partnerships, Engineering in Schools, Artificial Intelligence and Sustainable Development Goals. The lecture on sustainable development really struck a chord with me. If you haven’t already, I urge you to look at the United Nations 17 Global Goals for Sustainable Development by 2030. At Unicorn we are lucky to have a superb standard of education. Not only do we strive for our pupils and their families to have the advantage of this education, but we also want them to be aware of the basics they receive that some young people around the world do not. Two goals that stand out that we can talk to Unicorn pupils about include; good health & wellbeing, and quality education. Perhaps, in the years ahead, some of our children will be in a place to help the next generation around the world. It is timely that we have our Farmers’ Market this week and Harvest Festival assembly on Monday when we will be doing our small bit to help people less fortunate than ourselves. The three days at the conference reinforced the message that, due to the uncertainties of the world now and in the future, we need to equip our pupils with the tools to cope in ever-changing times. Now, more than ever, our children need to have knowledge. To be able to read, write and be comfortable with basic mathematics. To have a broad knowledge of history, geography, the sciences and other cultures before specialising as they get older. However, the softer skills are also crucial for success, not to replace this knowledge but to work alongside it, so that they can adapt to unknown and unexpected situations. We talk a great deal about our virtues at school. The Virtues Rainbow is a central point where we can discuss them as a school. In every classroom the pupils and their teachers are thinking about the benefits of these virtues and applying them. Skills such as resilience, independence, adaptability, collaboration and the others are not put together haphazardly, they have been carefully chosen as virtues that are necessary for the children to succeed as they get older. Children who can develop all these virtues, alongside their knowledge, will become the intellectually curious adventurers that are needed for the future.